Typical Austrian spring: winter says hello! Have a wonderful new spring my friends – je vous souhaite des merveilleuse journées en ce printemps, mes ami(e)s! The little white flowers you see above are SNOWDROPS – in Austria one says they are the first sign of spring. Actually they are growing THROUGH the snow, they have a sort of peak on their heads and only when they are through the snow cover they unfold their leaves and blossom. Austria and especially Carinthia is an alpine country and we use to have snow until April! In my homeland Carinthia, the state „Kärnten“ in the south of Austria, the Easter Egg and gifts search as well as the typical Easter snack is a Sunday Eve‘s ritual – i.e. it takes place on saturday – whereas in the rest of Austria the us is on Easter Sunday. Saturday morning starts with the traditional „Fleischweihe“ (consecration of meat) at church – a basket filled with food, mostly meat: traditional Carinthian bacon, ham and sausages are consecrated by the priest during the service. The colourness of all those Eggs – the cooked ones are hidden and later eaten but there are also all sorts of artistically painted eggs which serve as decoration on bushes, on flower bunches, on the house and in the home… – remind me of the Hindi Holi (Festival of colors or „spring festival“). Both symbolize spring and fertility and when looking out onto the nature, the flowers, the blossoms, the new green in the meadows and the fresh blue sky so it‘s quite obvious why mankind feels so attracted by colours and reflects nature in its colourful rituals…. As I‘ve mentioned before the traditional Easter meal consists among others in wet-cured ham and sausages which have to be cooked for some hours before serving them. The Carinthian people used to be rather poor farmers; so they invented to use the „soup“ where the ham was cooked also for a very delicious though cheap dish: the „Ritschert“. Into the water where the ham had been cooked they gave pearl barley, beans, carrots, celery and similar sop vegetable, juniper berries and laurel. Of course today meat economics is not the point and you find copped mouth pieces of ham or wet-cured meat in the Ritschert as well. At the end some vinegar is pored into. Although it was originally an Easter dish it is eaten all over the year in Carinthia. The Easter Snack consists of the colored eggs, the wet-cured ham: the traditional Carinthian „Osterschinken“, traditional sausages called „Krainer“, lots of fresh horseradish or „Eierkren“ (horseradish mixed up with finely chopped eggs, oil and vinegar, salt and pepper, mashed with a fork to a sort of paste) and last but not least the Reindling (a yeast cake with lots of sugar and raisins). We Carinthian people eat all those things at the same time, we put onto a piece of sweet Reindling a thick slice of ham and above the hot egg-horseradish which makes you cry! SO that‘s the definitive test if you are a native Carinthian – sorry to say that – but no Viennese would ever eat those delicious specialities at the same time – they use to take first the ham with brown bread and only afterwards – as dessert – the Reindling. No chance to convert those „strangers“ LOL! In the evening it is custom to burn all the garden rubbish like old leaves, cut branches and so on. So you sea big fires everywhere: in the gardens, near country inns, on fields, at farmers…. Usually people are gathering and enjoying the huge fire together. As you may imagine the kids are foolish about it, they are so happy to throw little pieces of wood into the fire…. Funny enough in Holi celebrations fires, burnings and gifts play a crucial role as well 😉 And also in Iran Nouruz you find the crucial fire and little sweet gifts 🙂 for me as a pagan being those parallels in symbolic and ritual motives are highly fascinating… and it makes me happy and gives me hope that different cultures have found similar symbols and rituals to express their collective feelings about the season circles in the year. Are peoples really so different? Isn’t there more uniting than separating??? The Easter Snack consists of the colored eggs, the wet-cured ham: the traditional Carinthian „Osterschinken“, traditional sausages called „Krainer“, lots of fresh horseradish or „Eierkren“ (horseradish mixed up with finely chopped eggs, oil and vinegar, salt and pepper, mashed with a fork to a sort of paste) and last but not least the Reindling (a yeast cake with lots of sugar and raisins). We Carinthian people eat all those things at the same time, we put onto a piece of sweet Reindling a thick slice of ham and above the hot egg-horseradish which makes you cry! SO that‘s the test if you are a native Carinthian – sorry to say that – but no Viennese would ever eat those delicious specialities at the same time – they use to take first the ham with brown bread and only afterwards – as dessert – the Reindling. No chance to convert those „strangers“ LOL! Enfin Printemps! Welcome Spring!!! Der Lenz ist da! Happiness and blessings to EASTER, PESACH, Πάσχα, NOURUZ, HOLI and MAWLID (the prophet‘s‘s birthday)! This year lent is very early, I‘m still fasting in a nearly middle-age way, from Ash Wednesday to Easter Sunday Eve no animal products at all (no meat, no fish, no eggs, no dairy products, no honey nor sweets), today is my last day, as here in my homeland Carinthia the Easter Egg Search and the traditional Easter snack takes place on saturday afternoon. this date marks approximately the new season of blossoming flowers and opening hearts; it‘s the time of new awakening life and fertility. The Easter Bunny and the eggs are ancient pagan fertility symbols, the resurrection of Jesus (after his death) reminds me of the ancient Greek Goddess Demeter myth concerning the seasonal growing and vanishing of plants. Both the Winter Solstice (where the Christian Symbolism has created the image of a new-born baby) and the Spring Equinox mark in different cultures the beginning of the New Year: like the Iranian Nouruz. pour moi le dernier jour du Carême et ne journée particulière spirituelle et contemplative… un peu triste si on pense ce qu‘elle symbolise et si on voit toute la haine surtout entre les religions au lieu de la tolérance et la réconciliation! for me a very spiritual and above all contemplative day – btw which I spent last year in the Moroccan desert: a real journey which I underwent at the end of my 40 days fasting period and it‘s related spiritual journey. I‘ve blogged about it. Shortly said: I’ll delete all people writing “shoot them down” or “do away with them” – no matter whom they meant, it’s all the same hatred – from my blog contact lists… NO TOLERANCE TOWARDS INTOLERANCE! Mes ami(e)s, je suis du retour! Pourvu que Yahoo a cessé enfin de faire des bugs! My friends I‘m hopefully back, it seems, Yahoo is bugging less, let‘s hope the best and give 360 a new chance! Mailbox and Top Page Comments are working again all day (and night) – let‘s celebrate and be happy!!! I‘ve missed the 360 community desperately, although I continued my blogs on Multiply, Myspace and blogger – it‘s definitely not the same! Tutankhamun (1341 BC – 1323 BC) was an Egyptian Pharaoh of the Eighteenth dynasty. He was only 8 years old when he began his rule and died approximately 10 years later. Only recent research discovered that he wasn‘t murdered but died because of an accident breaking his leg. His importance is due to his tomb, which uniquely was discovered almost completely intact in the Valley of the Kings– the most complete ancient Egyptian tomb ever found. What do you see at this Viennese Tutankhamun exhibition? The impression you get is you are entering more and more from the visible world into a sort of underworld or a grave respectively. First you have a all sorts of statues, it‘s emphasis is laid on the World of the Pharaohs, so you see different sculptures of the whole dynasty. Then more specific items coming from the valley of the Kings and especially from Tutanch‘s tomb are shown: little tables and other furniture, different boxes, a chair, a bed. The rooms get darker and darker. The most impressing items are the golden items like golden scarabs, little golden coffinettes to preserve the internal organs, all sorts of jewellery… Although the Viennese exhibitions doesn‘t show the big golden mask of Tutankhamun – this item you could see in London – you can see a medium sarcophagi coloured in gold and blue (there are different boxes to preserve the corps) and the highlight are Tutanchamun‘s golden Sandals together with golden sorts of gloves for fingers and for toes in order to protect them in the grave. Even when you are ordering the tickets quite in advance you‘ll have to visit the exhibition on a certain hour of a certain day… Is it worth all the troubles? Yes, indeed, this exhibition in Vienna is highly recommended and if you manage to visit the Golden Exhibition in London and the grave chamber in Zurich as well so you will have seen ALL precious items which are ever allowed to leave Egypt! You will see there over 130 Ancient Egyptian treasures, above all 50 major objects excavated from Tutankhamun’s tomb. They include the royal diadem – the gold crown encircling the head of the king’s mummified body – which he probably wore in life. Tutankhamun – his tomb and its treasures. There visitors can relive the fascinating story of the excavation, like in a novel. A reconstruction of the tomb is presented and can be entered; to preserve the originals from the damage of mass tourism the historic objects are duplicates. 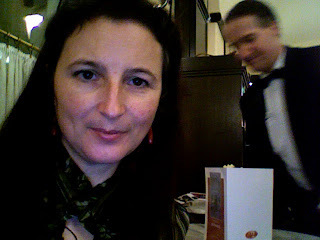 At the moment I’m sitting in a Viennese coffee house waiting for the opening at 4 p.m. later in the evening there will be a dinner reception in the museum of the Egypt embassy. While waiting for the dinner 😉 I’ll return to my favorite wifi coffee-house and write about my impressions of this exhibition and post some pics as well!